"Gallows Style" Height Adjustable Gong Stand. 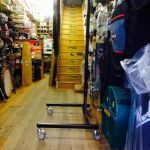 Suitable for any Paiste or Meinl Gong from 24" - 40". 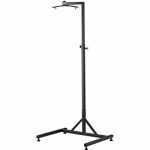 Made of metal, easy to adjust the height and this stand can be dismantled. When this stand is not holding a Gong it makes a fantastic coat hanger as well. So if you are a Paiste Gong player who likes holding dinner parties after your Gong Bath this could be the Gong Stand for you. If you are interested in learning more about Gongs and Gong Playing you can find out about Sheila Whittaker's workshops and events in South West England via the Healing Sound website. To purchase one of Sheila's books please visit the book page.